Bordered by the cities of Mesa, Scottsdale, Tempe, and the town of Fountain Hills, the Salt River Pima-Maricopa Indian Community is home to over 10,000 enrolled members and encompasses 52,600 acres, 19,000 of which are held as natural preserve. 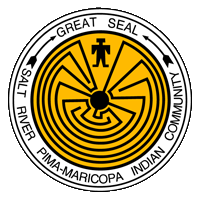 With two distinct backgrounds and cultures, the Salt River Indian Community is comprised of two Native American tribes: the Pima, "Akimel O&apos;Odham" (River People) and the Maricopa, "Xalychidom Piipaash" (People who live toward the water). The Community has many firsts of its kind on tribal land and proudly owns and operates several successful enterprises including Salt River Materials Group, Saddleback Communications, Casino Arizona and the Salt River Landfill. The majestic Red Mountain that can be seen throughout the Community and many parts of the east valley, is located on the tribe’s eastern boundary. The sight of the mountain symbolizes the home of the Pima and Maricopa people. If you’re looking to immerse yourself in culture, a visit to the Huhgam Ki Museum is a great start. Located in the heart of the community at Osborn & Longmore, the museum tells the Community’s history through the eyes of its people. Infamous tailgate diner, The Stand, is a great place to meet and eat with locals, located at Indian School & Alma School, just minutes from the museum. Located just off the 101 Pima freeway, on the tribe’s northwestern boundary is the Talking Stick Entertainment District; home to a thrilling casino, spring training baseball, electric kart racing, an aquarium, butterfly conservatory and so much more! The Talking Stick Entertainment District has a little something for everyone and the Salt River Indian Community is eager to share their culture and heritage of hospitality with you!